Samuel James Tilden "Jimmy" Sheckard (November 23, 1878 – January 15, 1947) was an American left fielder and left-handed leadoff hitter in Major League Baseball who played for the Brooklyn Bridegrooms/Superbas (1897–98, 1900–01, 1902–05), Baltimore Orioles (NL) (1899), Baltimore Orioles (AL) (1902), Chicago Cubs (1906–12), St. Louis Cardinals (1913) and Cincinnati Reds (1913). Sheckard was the Chicago Cubs' leadoff batter for the final game of the 1908 World Series, the team's last championship. 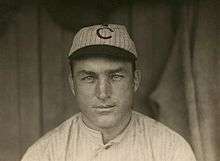 He played for four World Series teams in a five-year span from 1906-1910. Sheckard was born in Chanceford Township, York County, Pennsylvania. He enjoyed a great 1901 season with the Superbas, hitting .353 with 11 home runs and 104 runs batted in, and leading the league with 19 triples and a .536 slugging average. In that season Sheckard became the first and so far only player to hit inside the park grand slams in two consecutive games. With Baltimore in 1899, Sheckard led the league with 77 stolen bases. He played in four World Series with the Cubs, winning championships in 1907 and 1908; and he led the league in 1911 with 121 runs and 147 walks – a major league record until broken by Babe Ruth in 1920, and still a team record. He also had the dubious distinction of going hitless in 21 at-bats in the 1906 World Series, won by the Chicago White Sox over the Cubs. Sheckard was the first man to lead the league in homers and steals in the same season (1903). Ty Cobb (1909) and Chuck Klein (1932) are the only other players to do so in the majors. Sheckard was also a good outfielder. He holds the all-time single season major league record for double plays at two separate positions. His 12 double plays as a left fielder in 1911 for the Cubs is 2 more than any other left fielder in history. And in 1899, while playing for the Baltimore Orioles, Sheckard played right field and set the record for double plays by a right fielder with 14. See related article on all time double play leaders. In his 17-year career, Sheckard hit .274, with 56 home runs, 813 RBI, 1296 runs, 354 doubles, 136 triples, and 465 stolen bases in 2122 games played. Sheckard died at age 68 in Lancaster, Pennsylvania, from injuries suffered when he was hit by a car while walking to work along a highway. ↑ "Back-to-Back Slam Days". goldenrankings.com. Retrieved 29 November 2014. Wikimedia Commons has media related to Jimmy Sheckard.